Discussion of the day: What do you think? 1. Pyoderma and 2. Lick Granuloma means! In dogs is and tell me what can be done to help the dog/s who suffers from these conditions and what can be done to prevent it from happening in the first place and keeping it from happening again to the same dog/s. Which dog/s is prone to get this or is all dogs in danger of getting this - is it age related, is it abuse related, or do you think it could be related to the fact that people just don't know (uninformed owners/shelters, etc.)? You are welcome to place a photo of the condition with a small explanation in your own words and how you understand this condition! My old dog had a lick granuloma on her elbow. It was on the thickened area of the elbow that she started licking and it became quite inflamed (I think it was a pressure sore to start with due to where the thickening was). The vet suggested a cream that tasted awful to stop her. But it turned out not to be necessary because she was a complete angel and stopped licking whenever I saw her doing it. As she was with me 24/7 she wasn't able to lick too often once I realised what she was doing. I equated it to what I used to get as a child - a kind of hot spot around my lips that happened in winter - if I carried on licking my lips it would get more irritated and the need to lick more often occurred. If I left it alone, the irritation stopped. Now you have me rattling my memory box ..
Pyoderma is a painful bacterial infection which if not treated can spread rapidly (it usually starts around the legs in a dog or cat). One often comes across it in the townships where animals with a specific type of mange are left untreated and misdiagnosed by their owners who think that old motor car oil is the solution! How wrong can people be ...??? As promised, herewith the answers to the discussion of the day, although it would have been interesting to have more comments! Pyoderma: This is a skin disease accompanied by severe inflammation - areas affected are swollen, painful, red and warm to the touch, exudate's pus may cause crusts to form on the surface of the skin. 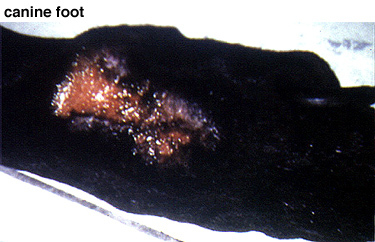 High temperatures may be caused due to blood poisoning (Septicemia) - losing interest in food. More prevalent during the hotter months, occurs mostly in younger animals at the mu-co-cutaneous junctions (Skin Mucous Membrane Interfaces) such as eyelids, lips, ears, **** and the genitalia, the paws may also be affected at times. 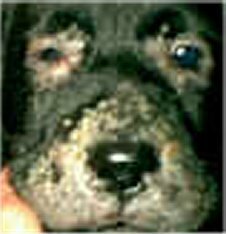 Caused by bacteria (Staphylococcus), treatment by veterinarian - antibiotics is required and sometimes for long periods at a time! 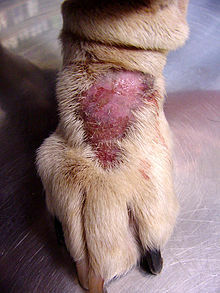 Lick Granuloma: (Sore that does not heal on the dog) - Caused by incessant licking of a particular area on the body, resulting in damaged skin. 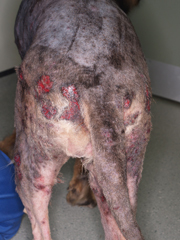 Lesions may appear on the animal's legs, mostly on the lower part of the forelegs - this developed over time where the skin becomes open, damaged and infected - common in large breed dogs kept in backyards, shelters, etc. More problematic behaviour than physical, this is a habit and can be broken by giving appropriate toys, take the dog for walks, spend some time with the dog, etc. Environmental Enrichment (Mental Stimulation) will relieve Boredom, the lesion should be treated like a skin wound!